A short walk near Hokitika, crossing the glacial-blue waters of the Hokitika River. 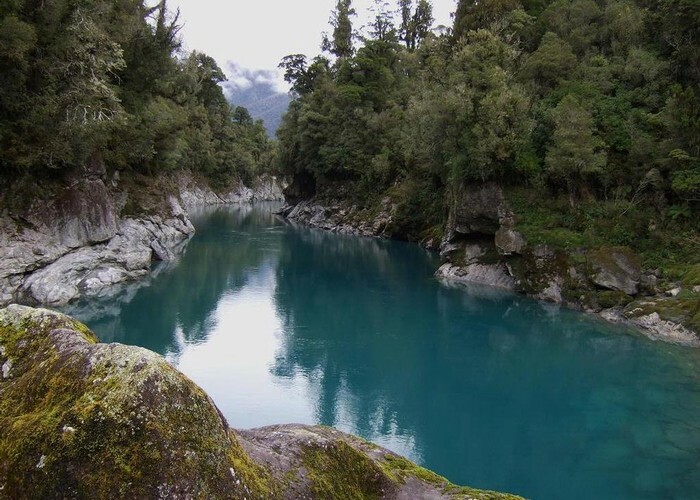 Hokitika Gorge is about 30 minutes' drive south and inland from Hokitika. Head for Kaniere, then Kowhiterangi, and follow the signposts. A short road turns off the Whitcombe Valley Road and leads to a surprisingly large car park. Here, there are new interpretation panels and toilets. A wide gravel track leads first to a lookout over the river, then down to a swingbridge. Over the bridge, there is access to the rocky riverbank itself. The river is a icy cold and milky blue due to the glacial flour brought all the way from the snowfields around Mounts Evans and Whitcombe on the Main Divide. 111 views in the past year (9 per month).